Look Here! is up at Villa Terrace! We had a wonderful opening night with nearly 200 attendees. Come check out the work that fourteen Milwaukee artists have created by mining the objects in our collections, especially our Digital Collections. Look Here! 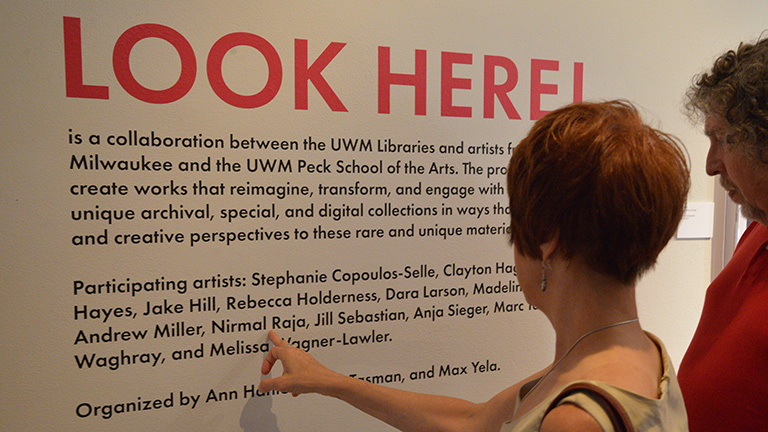 is a collaboration between the UWM Libraries and artists from RedLine Milwaukee and UWM Peck School of the Arts. The artists’ work, along with selections from the UWM Libraries’ collections, will be on exhibit at Villa Terrace now until September 16th. Free admission for UWM students, faculty, and staff.